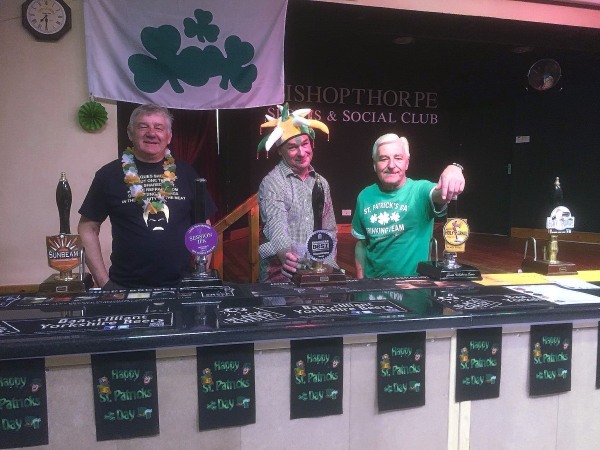 BISHOPTHORPE SPORTS & SOCIAL CLUB (voted CAMRA York Branch Club of the Year 2013, 2014 and 2015) will be holding its 6th annual St Patricks Beer Festival on the weekend of Friday March 17th to Sunday 19th. The festival starts at 6pm on the Friday night with music later on in the evening from local blues band “Up in Smoke”. Saturday kicks off at 12 noon until midnight with all the days sporting action on the TVs and big screen with music later on in the evening. Sunday once again starts at midday to finish off whatever is left! For all the details you can see the flyer here Beer Festival 2017. You can email the Club on bishopthorpeclub@gmail.com or telephone 01904 707185.